While I was visiting Fort Houston, I was wandering through the old factory/warehouse building and stumbled upon a room that felt like I had stepped back in time about 100 years. Like the wardrobe in “Narnia,” I was in another world. It was a huge wood shop with benches and hand tools all along two walls. The wood floor was covered in sawdust, shavings from hand planes, and chips from carving. There were all sorts of projects in various states of completion from gothic church carvings to modern benches with aluminum butterfly keys. As I stood there taking in the site of benches and walls loaded with carving and hand tools, an older gentleman steps out from the shadows in the back and asks, “Can I help you?” It was apparent he wasn’t used to visitors in this back corner of a warehouse. I told him I had just stumbled into the room and was admiring his work and tool collection. He immediately pointed out a few of his tools that had belonged to his great grandfather. After asking his permission to snap some photos, we struck up a lively conversation and he proceeded to show me some of his unique projects. One project was the bench that had been made by his father and carved with his name. Then he stoops down and grabs an odd-looking wood box with a large hole in the top. Turns out it’s a vacuum-assisted carving vise. He picked up an old bowling ball that had a short piece of pipe with a wood block stuck in it. He places the ball on the box, hooks up a vacuum, and clamps his carving to the pipe stem. The vacuum creates a tenacious hold on the bowling ball yet it can be pivoted to any position. Ingenious. Next he had to show me the carving vise he made from an old dentist’s chair. He can elevate the work with a foot pedal. Brilliant. His son soon came out of the back room and they told me about some of the work they have done, some nationwide for retail stores. Their website shows you some of the more interesting projects they’ve done. 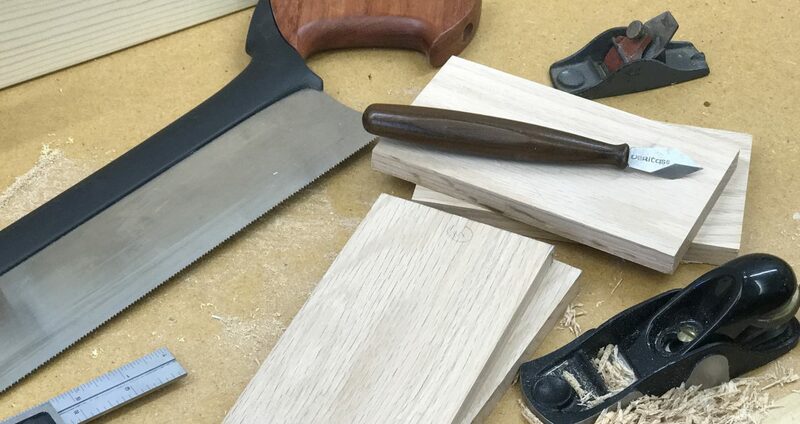 Posted on August 23, 2013 August 21, 2013 by Randy MaxeyPosted in Behind the Scenes, Clamping, Custom Furniture, Fine Woodworking, Hand Planes, Hand Tools, Woodworking, WorkbenchesTagged craftsmanship, Design, Furniture, Hand Planes, Tools, Woodworking.